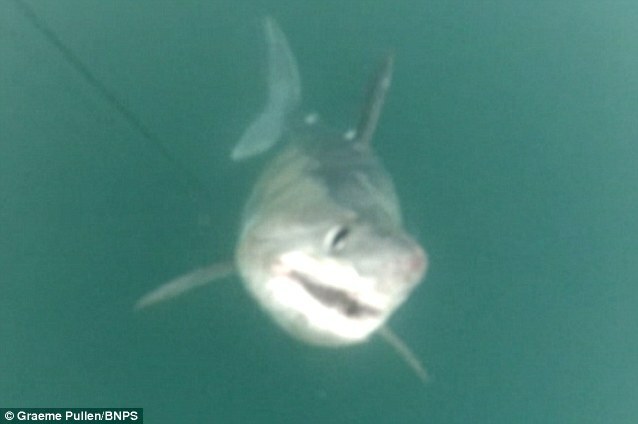 Just 300 yards off a Boscastle, North Cornwall, UK, two fishermen caught the largest shark ever to be hooked in UK waters yesterday. The shark fishermen were out catching tope and nursehounds for tagging when they had an unexpected bite on the line. The battle ensued for 90 mins before the behemoth shark was pulled along side the boat. Gathering photos and videos of the event, the shark has been successfully identified as a female porbeagle shark (Lamna nasus). The shark was an impressive 10ft long and an estimated 550lbs (43lbs heavier than the previous record). What is highly commendable of these fishermen is that they released the shark after its capture…..(if only all recreational fisheries adopted this method!) 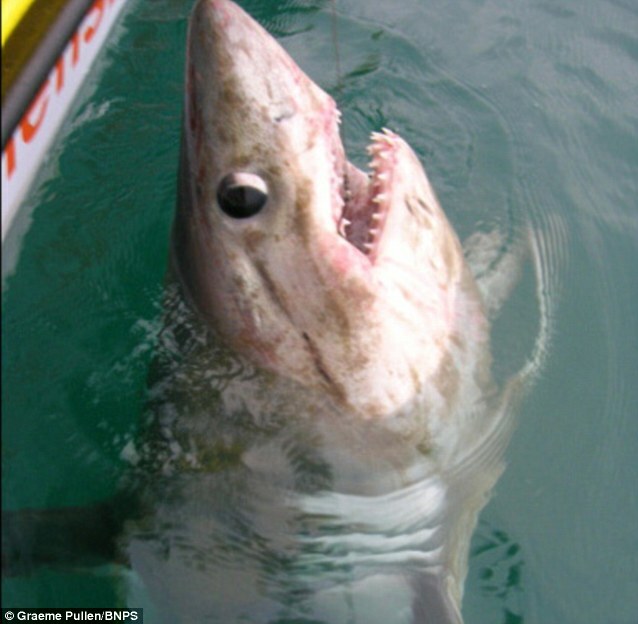 The porbeagle is current protected under EU regulations due to the sharp declines in abundance of this species. Its great to see such a large potentially pregnant female being released back into the UK waters where hopefully it will make a full recovery. As a consequence of the 90 minute battle with fishermen and the exhausted state at the end of the ordeal, i wouldn’t be surprised if we see this animal in the news a few days later washed up on shore…..lets hope not though. A question I’ve long had about these lamnid sharks, and most pelagic sharks for that reason, is why have they evolved this countershaded coloration pattern. I understand that when looking down at their backs with the dark seafloor beneath, contrast is reduced and it becomes more difficult for the eye to focus on them or see them at all (camouflage). However, I always assumed their light colored bellies were meant to blend in with the bright surface water if looking at them from below. Yet, this is not the case. When they swim above an onlooker, they cast a very conspicuous silhouette which would exist regardless of the color of their ventral side. Therefore I’m not sure I buy into the whole shark countershading adaptation. It would make more sense to me if they possessed photophores along their abdomen which they could use to counter-illuminate and blend in with downwelling light, but I don’t think lamnid sharks have such aptitudes. Very good question and one that I have contemplated myself. It has been recorded that some juvenile sharks have become darker with “increasing exposure to solar radiation (Lowe and Goodman-Lowe 1996), much the same way as humans tan in the sun”. Maybe the counter-shading is a product of solar exposure in sharks that spend considerable time near the surface. Additionally, to some extent, breaking up a silhouette from below with lighter coloration would still work in low light environments (cloud cover, dusk etc). I can certainly speak from experience having dived with reef sharks & tigers, from a distance, they are sometimes hard to make out. Very interesting. I can attest that sharks in shallow water do get darker backs. Out here at the Hawaii Institute of Marine Biology we have a few hammerheads and sandbar sharks which we keep in a shallow lagoon (3-10ft deep, depending on tides). Our sharks were much lighter when we first caught them and put them in the pins then after a few weeks of UV exposure in shallow water.